Okay, maybe I’m just another spoiled American, used to having lots of personal space, but something has been bothering me recently. I’ve ranted about restrooms before, but this is a little different. This time I thinking more of general behavior. I know most women have never been in a men’s restroom, but they are disgusting places. They also aren’t really designed for privacy in any way. Urinals are a great invention for its simplicity, but the way they are installed leaves room for improvement. Generally they are only about a foot apart with a pathetic divider between them. Stalls have full formed walls dividing them. Urinals get a one foot by three foot board mounted so it starts at your shin and goes up about chest high on me. That means it ends at about 4.5 feet. What’s the point? This isn’t high enough to offer privacy, so I’m not sure why they bother. The place this really becomes a problem is in busy restrooms. Of course the busiest restrooms, the ones in sporting facilities, don’t even bother with dividers. Reliant and Minute Maid in Houston both just have a wall of urinals all spaced about a foot apart. This results in lines of men staring at the wall trying to ignore everyone around them. Fun stuff. Sadly this is an improvment over the Astrodome. They just had a giant metal trough. No division, just a huge trough that everyone had to line up at. Classy. The big problem with all of this isn’t even the restroom itself much of the time. Its the people using it. For example, if there are five urinals and I’m the only one using one I generally choose one by the wall. This eliminates the potential to be surrounded. Now why, every once and a while does some creepy guy decide in this situation to use the urinal next to me? There are four options and they choose the creepiest one. That’s just wrong. Same thing goes for the stalls. I thought it was an understood thing, there should always be a buffer whenever possible. I understand when restrooms are busy the buffer isn’t always possible, but seriously people why would you not have a buffer? Do you really think someone wants to share the experience with you that much? Do you really want to share someone else’s time with them? Like I said, maybe its an American thing, maybe its a guy thing, I don’t know. I know other guys are this way, I just wish they all were. So next time you use the restroom go ahead and spare me the closeness and leave that little buffer. I’d thank you, but talking while using the restroom is a whole other rant. Am I the only one that thinks of Gremlins when I hear this song. I just think of a messy microwave and such. I guess its a generational thing and not everyone will get this. In the movie Gremlins this song is playing when one of the gremlins is looking for trouble. I believe it is hunting the mom. She ends up getting it in the microwave and nuking it until it explodes. This of course triggered the scientist in me to want to blow stuff up in the microwave. It also ingrained in my memory this song as going with gremlins. Its also just one more Christmas song. Some Christmas songs I really love, but they start being played so early I generally burn out. The same songs played five times a day gets old. When I worked retail during college it was even worse. Thankfully now I can avoid it at work. I can also play some of the better Christmas music from groups I enjoy. There are also a number of non-traditional songs to cut through the repetition of 20 versions of the same ones. For example, I have never roasted chestnuts on an open fire, but apparently ever singer who has ever made a Christmas CD has, and they want to sing about it. Wow, how’s that for a run on sentence. Anyways, I’m sure other people have thought the same things about different Christmas songs. When you hear a song many times in a particular situation, say when hunting a gremlin, it burns an image on your mind. That’s what has happened to me, and I know I can’t be alone. All this talk of change just makes me think of diapers. Let me tell you, I don’t need more reminders of diapers. I’m glad I’ve only got one kid. I can’t imagine how those people with sextuplets and such survive. I know its only the middle of October, but if you go shopping its very evident that we are in the “Holiday Season”. I think this is total crap and a sign of overloaded commercialism, but it brings up some decisions soon. Do I, as a parent, want to be a liar? What I mean is this, do I want to follow tradition and tell Levi about Santa Claus as truth? Do I then want to do the same with the Easter Bunny and the Tooth Fairy? This is something I’ve thought about numerous times, and I don’t think Kendra agrees with me on it. To me, telling your child a lie, for no other reason than to try to illicit good behavior, or because everyone else is doing it, goes counter to everything else we try to do as good Christian parents. We want to instill honesty and good behavior in Levi. We want him to behave because its the right thing to do, not because some obese elderly gentleman living in another country has some sort of magical big brother system watching his every move. If you really think about Santa its quite a scary and creepy premise. This guy is watching you all the time and keeping track of what you do. He’ll reward you if you’re good, but give you nothing, or something not wanted if you act poorly. This is all rather Orwellian. Add to this his being surrounded by elves that he works year round to produce the things he gives away. Then add the idea that he lives at the north pole and is hauled around the world by eight or nine flying reindeer, one of whom has a bizarre glowing red nose. Its all very odd. The tooth fairy and the Easter bunny are more of the same. They are lies you must perpetuate until the child finally realizes you are lying. Then you can give up or, like my mom try to keep you convinced. It can be pretty frustrating to be a kid who knows better and to still get lied to. I just don’t want to do that. Like the article linked above mentions, it also just increases the wrong focus for the whole holiday. It goes from being focus to Jesus, a person who came to die for our sins to some guy who’s more worried about works than faith. The worst part of that is the guy Santa Claus is based on was a bishop and probably wouldn’t like what has been done with his legacy. It all seems very wrong. I know this is a subject I’ll be thinking on a lot, especially as Levi gets older. This year he’s only going to be 10 months old, so the impact isn’t quite as severe, but it still sets a foundation. I’m hoping to have him grow up knowing the truth. Santa Claus is based on a man who worked hard to do God’s work and was a very giving man. Stories say he gave away money and gifts in the night to avoid the publicity of doing it. He didn’t require anything in return, and certainly didn’t watch people all the time. To me he provides a lot better model to teach children about. If you don’t get this go check out how the Cubs did this year. I am so ready for the election to be over. I realize elections are important. They decide who is going to direct the wasting of taxpayer money for the next several years. They also decide who will get blamed for everything that has gone wrong during the next election. I’m just tired of hearing about them. The current president has angered a lot of people, including those in his own party. The democrats blame everything on him and try to say McCain is exactly like him. McCain wants to move on from him, and tries to point out that he has different from Bush on a lot of subjects. This of course gets ignored, lather, rinse, repeat. One thing I’m definitely getting tired of is comics getting political. Comics are supposed to be about humor. There are a few comics that are specifically political and that’s fine, people know what to expect. However, other comics like PVP, Get Fuzzy and others are doing the same thing and I think its wrong. People read these comics to escape and enjoy themselves, not to get your view thrust upon them. Hollywood, you can shut up too. Movie stars are just that, movie stars, they aren’t there for their political commentary. This whole election has been screwed up from the beginning. We have an inexperienced man versus an experienced one. This and where they stand on the issues should be the only focus. Instead we have discrimination and stereotypes. When Clinton was running her being a woman was a huge focus and made fun of a lot. Palin now faces the same thing. If you did this for any other job it would be illegal and you could face charges of discrimination. Many democrats have ragged on McCain’s age, another area of discrimination that is generally illegal. All of this picking, but even mentioning that Obama is black can get you screamed at and threatened. I think none of it should have any bearing on the election, but it will. This year there is an expectation of the highest minority voting in history. Is it because there are more important issues? Is it because what the candidates have said is more important? No, its because one of the candidates is a minority. That’s a ridiculous reason to vote. On the news the other day a woman who was in her 60s was going to vote for the first time. That means she had pissed away at least 10 chances to vote for a president in her lifetime. TEN, thats more than the whole country of China gets. That’s more than most of Africa will ever get, and she completely ignored it. Any why was she voting? Did she have some epiphany that she was wasting her God given rights paid for by the blood of American soldiers? Nope, she just wants to vote for a black candidate. Nothing about issues, only race. Why should something as ridiculous as pigmentation decide our election? It shouldn’t, but it probably will, and that’s just a small glimpse of what is wrong with our country. Okay, maybe not the greatest evil, that’s Oprah, but there is another insidious evil lurking out there. This evil I speak of is broccoli. Foul smelling, horribly tasting, weird looking broccoli. As we introduce foods to Levi I find myself having trouble ever wanting to introduce broccoli to Levi. I mean its just so nasty. The smell of it cooking actually makes me nauseous. How can I do something like that to the little boy I love so much. 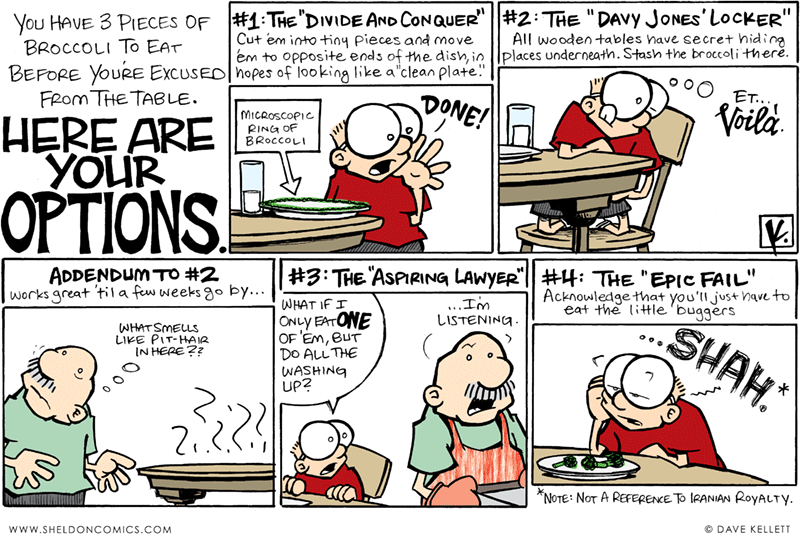 Broccoli is a relative of cabbage, which explains the nasty smell when cooked. In fact, according to the all knowing Wikipedia, broccoli, cauliflower, cabbage, kale, kohlrabi, and brussels sprouts are all the same species. The only difference is how they’ve been cultivated and bred. I know its a healthy vegetable to give to Levi, but it is definitely going to be a large hurdle for me to overcome. Anything that nasty just doesn’t seem right. 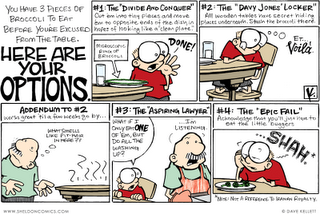 In honor of my distaste for broccoli here are some great comics on the subject from the Sheldon comic. This is a great comic if you haven’t read it before. And a bonus comic to make fun of broccoli’s albino cousin, cauliflower. Politicians have a lot in common with babies. They are both attention hogs, taking as much as they can get and always looking for more. They both leave disgusting messes behind and take no responsibility for cleaning them up. Once you have them they both take up a lot of time and money and you have them for a set term. You can’t understand most of what they say, but they say it very loudly and firmly. Luckily most babies are cute and fun to play with. Most politicians aren’t, though Palin isn’t too bad looking. You can at least hope your child will mature and grow out of most of his bad habits. The politicians seem stuck in them. When you have a baby and you are around them at their best you know that it was all worth it. When you get a politician you realize all you got was the lesser of two evils, if you even get that. I’m glad I went Levi in 2008, it was the only way to go, and it sure beats what I’ll get this November. I routinely check out snopes.com for urban legends so when someone invariably emails me one of them I can respond and hopefully help prevent its spread. Today’s entry was a thought provoking one. How we live our lives has a lasting effect. If we have children what we do can ripple on for a very long time as they in turn have children and leave their mark on the world. It is easy to go through life looking out for yourself most and not trying to make a more lasting positive mark, as was apparently the case of the woman described in the entry. I hope I can make a different mark than she did. Being a father is an intimidating thing to me. I am making decisions that will affect Levi for the rest of his life. I pray about it and hope that I am making the right decisions. I know Snopes probably wasn’t really intending to create fodder for blogs and conversations, though the person who placed the obituary probably was. Our society has certainly moved away from looking at our actions and judging what we should do to leave a lasting positive mark. Maybe reading an obituary like that will make a few people stop and think about what they are doing to those around them. Of course, then comes the hard part, trying to change. I hope we can all leave a positive mark, and that our ripple out as the generations come will be a good one. So apparently the IOC is run by people who choose to ignore the real world. When China was given the 2008 Olympics it promised to clean up its image. This meant cleaning up pollution, as well as humanitarian problems. Its now 2008, how are they doing on all of that? Earlier this year China put down protests over Tibet in a most violent manner. They still limit freedoms in numerous ways. Taxis found in Beijing during the Olympics are bugged and can be used for surveillance at any time. US Olympians and other visitors have been warned to take the battery out of their phones to prevent China from turning them on and listening without their knowledge. So it sounds like the humanitarian and other problems are still there. I recently heard people from the US EPA measured pollution in Beijing on a scale they use in the US. 50 is considered the maximum safe reading for people. Houston for example gets up to 30 at times when it is bad. Beijing was measuring a 90. But according to the Chinese government the air is safe for the athletes. The scary thing is this reading is after having a lot of cars kept of the road and many plants completely shut down for weeks. Sounds like the pollution cleanup is a failure too. 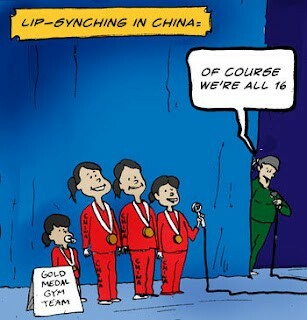 The Chinese gymnasts just won the female team gold medal with a team that has caused a lot of controversy. Apparently the minimum age for competition is 16. Looking at the Chinese team they sure don’t look that old. According to records the New York Times found they aren’t that old. Heck, at least one of the little girls was missing teeth. Generally all permanent teeth have grown in by age 12. Now I’m sure she could have lost a tooth some other way and it was a permanent one, but I’m betting that’s not the case. So this means China has cheated, in an organized way. After all, their passports say they’re older than records from competitions and the human eye would imply. Next we’ll find out they’ve got labs researching new steroids to help them win all those weight lifting gold medals. So on many fronts it seems like China has failed to live up to expectations, both in their hosting and in competition. The IOC doesn’t seem to care, as they’ve done nothing about any of it. After all, they’re still getting their publicity and attention, so who cares. I guess it doesn’t matter what the host nation does as long as the IOC benefits. Maybe the 2016 Olympics will go somewhere even more exciting, since the 2012 ones are going to the relatively tame Londoners. Lets see, who can we have to top China. Iran? North Korea? How about Sudan, I hear they’re working on improving just like China right? I suppose they aren’t a very wealthy country though, and they lack the power of China, but they can make it work, at least using IOC logic. Update: Just saw this great comic on ESPN page 2.